Until July 19th, as part of the Wargame Vault Summer Campaign, you can get the entire HAVOC Bundle for 20% off! 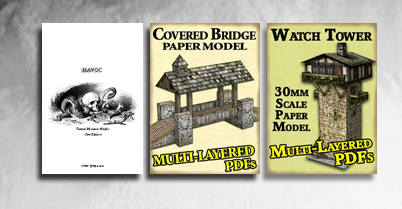 Not only do you get the full version of HAVOC, but you also receive the Covered Bridge and Watchtower multi-layered PDF models from Dave Graffam as an included bonus. The discounted price of the bundle almost equals the normal full price of these two models alone!! Haven’t picked up HAVOC yet? Have a friend you’re trying to get into the game? Need an electronic copy or just want to try you hand at making some paper terrain? Well, strike now while the iron’s hot (and the price is right)!